According to the rhetoric of some of our most prominent elected officials, New York is a national leader in social justice and progressive policy. There are many examples to support this claim. New York was an early adopter of marriage equality; it has some of the country’s strictest gun regulations; the minimum wage is one of the highest in the nation; and it embraced the Affordable Care Act and expanded Medicaid - to name a few. However, this narrative of New York as a progressive leader obscures other evidence that shows us leading the nation in economic and racial inequality. The income gap between rich and poor is larger here than any other state. By at least one measure (public school segregation), New York also ranks worst in racial inequity. As a result, the lived experience of millions of New Yorkers is in sharp contrast to the state’s prosperous, progressive reputation. New York’s second largest city (Buffalo) has a child poverty rate over 50 percent, for example, and its fifth largest city (Syracuse) has the country’s highest concentration of Black and Hispanic poverty. According to a report released last year by the United Way of New York, 44 percent of New York households are struggling to meet their basic needs. These statistics tell a troubling story about our state. Poverty and hardship are not aberrations in an otherwise functioning society - they are the way society functions for nearly half of New Yorkers at any given time. Every region and demographic in the state are impacted, but people of color, women, LGBTQ+, the disabled, and other marginalized communities are affected disproportionately. The Truth Commission on Poverty in New York State created spaces for New Yorkers impacted by poverty, inequality and racism - and faith leaders, service providers and advocates who work with them - to tell the truth about what they and their communities experience. The Commission included public hearings in three regions of the state - the western Southern Tier, the Capital Region, and Long Island. These sites were chosen because they represent three distinct types of communities - rural Western New York, urban Upstate New York, and suburban Downstate New York. The hearings, which took place from June through September, collected testimony from 82 individuals. While there are obvious differences between these three regions, the testimony at each brought out common themes and insights. First, people articulated similar struggles throughout the state. These included lack of access to quality healthcare, low wages and unemployment, discrimination based on race, gender identity, disability, immigration status and criminal record, difficulty accessing needed social services, homelessness and substandard housing, unequal access to education, and an inability to escape poverty despite education and employment. Second, in all three regions testimony identified the inadequacy of both the popular understanding of poverty and the structures set up to address it. Testifiers powerfully contradicted stereotypes about the poor as lazy or otherwise at fault for their struggles. Instead, their stories showed how people doing everything “right” (e.g. getting an education, working, and contributing to family and community) are still stuck in poverty. They also described how the social safety net is insufficient to meet people’s basic needs. In addition to these concrete recommendations, testifiers also identified broader, more fundamental shifts that are needed in order to achieve the structural and policy changes necessary. One clear message from each of the regions was the urgency of addressing structural racism, and the deep connection between racial and economic injustice. The testimony made clear that poverty is not a Black issue or a White or Latinx issue - every demographic of New Yorkers is impacted. However, the impact on communities of color is proportionally much worse due to structural racism in our educational, employment, housing, criminal justice, and financial systems. Another common insight was the need for a shift in the public consciousness about the causes and consequences of poverty. Popular stereotypes about poverty understate its impact and demonize the poor, contributing to a public narrative that often either ignores poverty or justifies it. The stories shared as part of the Truth Commission undermine that narrative and call for continued work to change the discourse on poverty in New York State. The organizers of the Truth Commission on Poverty in New York State hope that this process contributes to changing the public narrative around poverty in our state and - most importantly - leads to continued solidarity and collaboration toward building a social movement that can end the injustice and indignity described in the testimony in this report. In addition to the commissioners and testifiers, the authors are deeply grateful to the following individuals and organizations for their contributions to this report: Hallie Traiman and Lindsey Jordan transcribed the testimony. Vianne Singh, Alex Stokes, and Skylight Pictures edited and uploaded video. Elizabeth Press, Brad Weaver, Channie Waites, Sarah Krull, Colleen Wessel-McCoy and Skylight Pictures documented the Truth Commission events. Lesley Paparone and Emily Otto provided editing help. Lindsey Jordan, Ursula Rozum, and Bobby Black assisted with compiling statistics. Adam Baldwin designed the Truth Commission on Poverty in New York State logo. 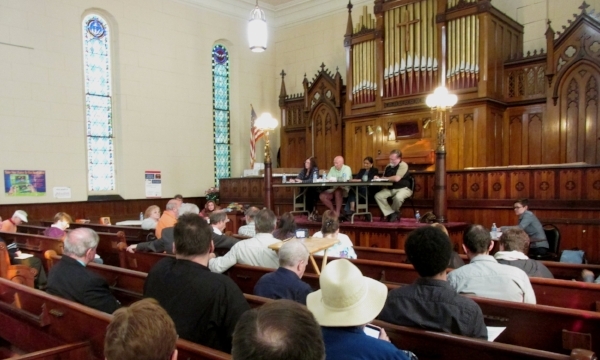 Funding for the Truth Commission came from the GROWTH Fund at Eastern Parkway United Methodist Church, First Reformed Church of Schenectady, and the Peace with Justice program of the Upper New York United Methodist Annual Conference. Wantagh Memorial Congregational Church and Food Not Bombs-Albany also provided meals.